Mexico has one of the worst obesity rates in the world — 32.8 percent of the population were in the dangerously overweight category in 2013. 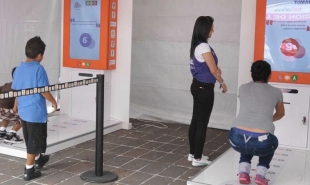 In an attempt to improve the health and fitness of its citizens, the Mexican government has intervened, installing motion sensitive machines in the city’s subway stations, which will give a free ticket — usually five pesos — to any commuter who completes ten squats. We have seen similar initiatives, using monetary incentives to encourage exercise and healthy eating, elsewhere around the world. The Russian government ran a like-minded scheme in Moscow in the run up to the 2014 Winter Olympics — the exchange rate there was a bit steeper, with one train ticket costing 30 squats. Simultaneously, we’ve also seen enterprises such as Urban Engines hoping to ease congestion on popular travel routes. Encouraging customers to do exercise in the station will certainly slow some of them down but perhaps the two incentives could be combined — a free train ticket for customers who walk past the busiest stations and board at the next stop?